Johnston, T., & Schembri, A. (2007). Australian Sign Language (Auslan): An introduction to sign language linguistics. Cambridge: Cambridge University Press. 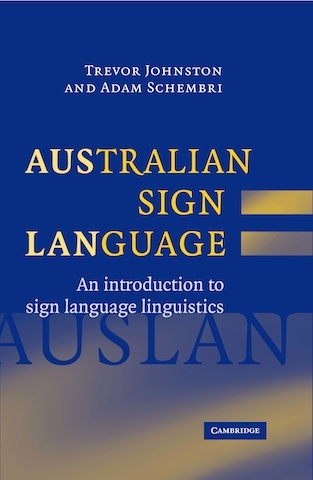 This book introduces the structure of Auslan and other signed languages (its vocabulary and its grammar) to students of language and general linguistics. It also provides learners of Auslan with accessible information about how signs are made (phonology and morphology), what the different types of signs found in the language are (fixed and productive vocabulary, as well as gesture), and the way signs are put together to make sentences and tell stories (grammar and discourse). The book gives many glossed (written) examples from Auslan. We plan to put hypertext links to video clips that illustrate all of the examples. However, completion of this page will only be possible if we can secure financial support to pay for deaf sign language models and media professionals to make these clips. We hope that government or private support will eventually become available to make this possible. Johnston, T., Cresdee, D., Schembri, A., & Woll, B. (in press). FINISH variation and grammaticalization in a signed language: how far down this well-trodden pathway is Auslan (Australian sign language)? Language Variation and Change.